“Iiiiiiiiittt’s Charger time!” The familiar voice of WCSR’s long-time broadcast icon Tony Flynn trum­peted over the air­waves. Before the start of every football game, Flynn was up in the college press box preparing for another fast-paced segment of play-by-play Hillsdale College Charger cov­erage. Flynn passed away on Jan. 21 at 92 years old, due to com­pli­ca­tions fol­lowing a stroke at the home of his son and daughter-in-law Tony Jr. and Erica Flynn, about 20 miles from the city of Hillsdale. But Flynn’s legacy of ded­i­cated com­munity service lives on. People in Hillsdale County remember him not only for his many years on WCSR radio but also for his par­tic­i­pation in many vol­unteer service projects with Hillsdale Hos­pital, United Way, Kiwanis, and the Exchange Club. In 1999, as a tribute to his 38 years of Charger football game broad­casts, Hillsdale College inducted him into its Ath­letic Hall of Fame. Flynn’s broadcast career didn’t start in Hillsdale, however. His first radio job was an announcing position with WDBC, Escanaba, located in Michigan’s Upper Peninsula, where he remained through high school. 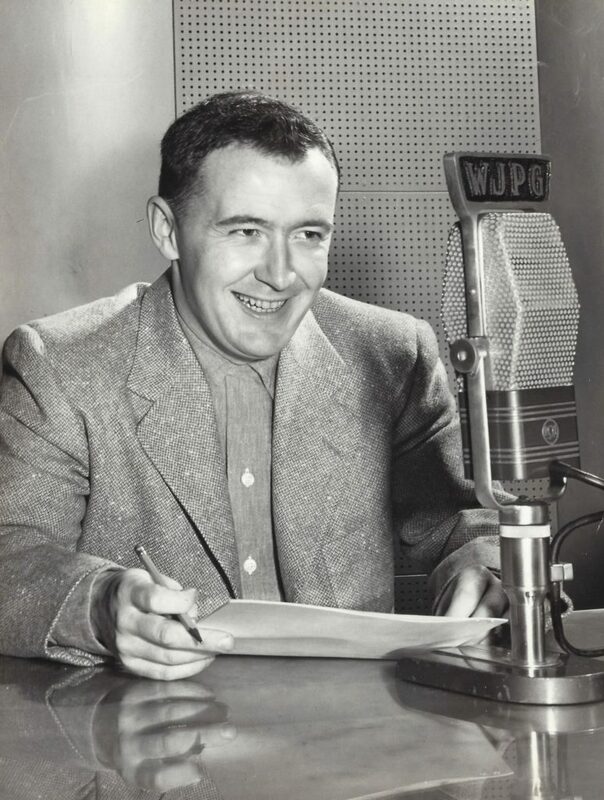 After a brief enrollment at Mar­quette Uni­versity, a short stint in the U.S. Air Force, and a return to WDBC, Flynn got his big broadcast break in 1951 at WJPG, Green Bay, Wis­consin, where he spent six years broad­casting Green Bay Packer games on the state network, in addition to news and com­mercial announcing. “He was the voice for the Packers in the mid-50s to late 50s before football became popular on tele­vision,” Flynn’s son, Tony Jr., said. In 1957, he began tele­casting for the American Broad­casting Net­working in Mil­waukee, con­ducting 5-minute news and sports­casts 17 times a week. Afterward he joined WISN Radio and Tele­vision in Mil­waukee where he served as sports director, con­ducting daily news and sports broad­casts on radio and tele­vision. Then, in 1961, Tony’s brother, Fahey, bought Hillsdale’s local radio station, WBSE — now WCSR on West Street. “Fahey wanted buy a radio station, and this one was for sale,” Flynn’s son Mike said. “Fahey said to my dad, ‘The only way I’ll buy the station is if you run it.’” With the past face of his broadcast career in Wis­consin, Flynn and his wife, Marian, felt like Hillsdale would be the perfect place to slow down and for Flynn to be able to spend more time at home. After a few years in Hillsdale, Flynn even­tually bought the station from his brother. When he first got to Hillsdale, the radio station didn’t produce play-by-play broad­casts. Flynn was able to bring his national news­casting prowess to the station and transform the broadcast style of local college and high school ath­letic events. Flynn and his broadcast partners would also travel with the college football team to all of their away games, just like Flynn did for the Packers. Nichols added that having been a com­mu­ni­ca­tions major without any outlet for news­casting at the college, he con­siders himself lucky to have had the oppor­tunity to work with Flynn at WCSR. Flynn’s oldest son Mike also got involved in the family radio business from an early age, lis­tening to his father’s game cov­erage in Mil­waukee. Mike worked with his father for 50 years until Tony retired from WCSR in 1999, and Mike has run the station ever since. He gained a lot from observing his father in the sports­casting trade. Mike also said Tony’s play-by-play sports­casting made him adept at cre­ating word-pic­tures. Flynn broad­casted more than sports; he also kept members of Hillsdale County updated on all the latest news and events. Many in Hillsdale recalled tuning into the station every morning and hearing Flynn’s voice on the radio. Flynn took seri­ously not only the games but also his pre-game break­fasts, which he shared with his broadcast color com­men­tator Jim Eck­hardt and former Hillsdale College Ath­letic Director Jack McAvoy. Eck­hardt said he also appre­ciated Flynn’s sense of humor. On one occasion when Eck­hardt was driving with McAvoy and Flynn back from a game at Michigan Tech, McAvoy, who was driving, got the three of them pulled over for speeding. Flynn was known not only for his sense of humor, but also for several com­munity service projects. He co-chaired the “Yes We Can” Cam­paign, a $1 million fundraising project for the Hillsdale Hos­pital that led to the cre­ation of a new critical care unit. The hospital’s prior critical care unit was very out­dated, according to Judy Gabriele, director of com­munity out­reach at Hillsdale Hos­pital. When asked why he gave up his national broad­casting gig to come to Hillsdale, Mike Flynn said it was because of his genuine care for the com­munity. Beyond his com­munity service, Mike empha­sized that Flynn reg­u­larly attended church and was an excellent father. A vis­i­tation will be held at Van Horn-Eagle Funeral Home from 4 to 8 p.m. on Feb. 6, fol­lowed by a funeral mass at St. Anthony’s at 11 a.m. the fol­lowing day.